Who knew that an ice cream NOT made from dairy could be so delicious ? Hallelujah! Another alternative for vegans and the lactose-intolerant. Thanks to Raw Ice Cream Company, vegans and rawists now have a sweet treat to consume. 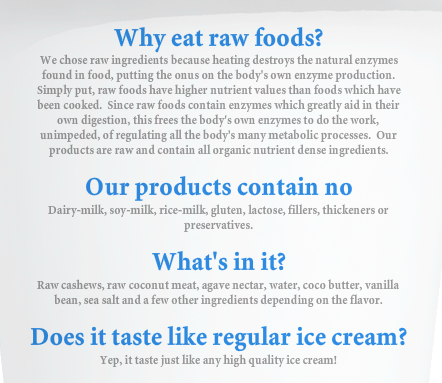 And let me tell you: even if you are NOT vegan, you are *STILL* going to love Raw Ice Cream. It is just that awesome. Founded in 2007, Raw Ice Cream Company is based out of Long Beach, New York. Their ice cream is vegan and entirely free of soy, rice, dairy or preservatives of any kind.The ingredient list is unbelievably pure and real: homemade coconut milk, raw cashews, agave nectar, cacao powder, whole vanilla bean, sea salt, and raw cocoa butter. That is it. Who knew it could be so simple? NO PROCESSED SUGAR AND NO ANIMAL FAT! Yeah, sure, some people might complain that this ice cream has cashews and cashews are nuts with fat. But it is *good* fat. The fat that comes from cashews helps lower cholesterol, decrease blood pressure, and cleanse your arteries. So, ladies, this fat is good for you and crucial in your diet. 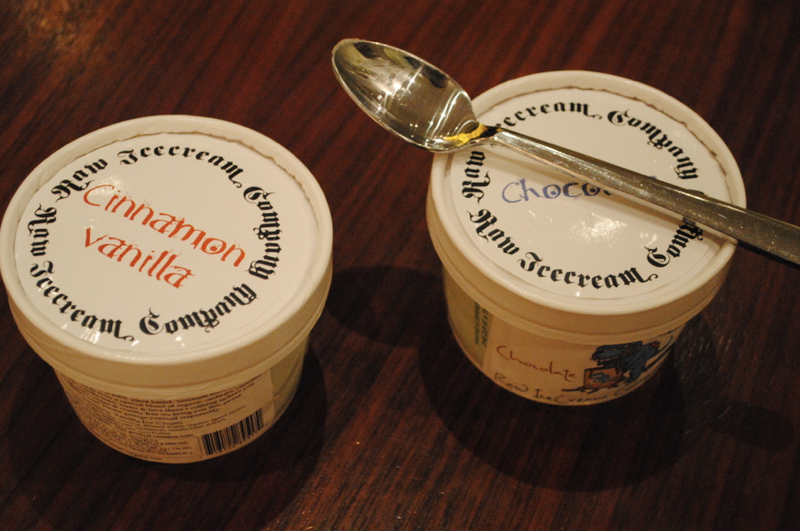 So, don’t just eat a spoonful of this ice cream, eat the whole tub! Currently, they offer 8 different flavors of ice cream: chocolate, vanilla, chocolate hazelnut, chocolate cookie, chocolate fudge, vanilla fudge swirl, mint, and mint chip. Ready for dessert with not just ONE carton, but TWO!!! Jackpot!